Did someone mention in the past that the equations at the Oracle are no good? Or were they good? Am I better off going with the Kwok slide 13? Quick glance: I took a quick gander at them and they all look identical, insofar as being related to X'm,n and Xm,n (the zeros of the derivative of the Bessel function or the zeros of the Bessel function respectively) for TE and TM respectively. What difference do you see between them? The expressions for ChrisMueller and Wikipedia look identical except for the factor of 2*Pi due to the fact that ChrisMueller calculates the angular frequency (omega) while Wikipedia calculates the frequency (f). Since omega = 2 *Pi*f, the expressions in Wikipedia and in ChrisMueller are both identical and both are correct. Kwok's expression is missing the factor of the squareRoot of the relative permeability and relative permittivity of the cavity filling because Kwok explicitly wrote that he is calculating the example for air inside the cavity. (For a vacuum they are exactly unity, for air they are approximately unity). silly enough the ^.5 part because I'm used to seeing sqrt typed out, but that works too. Thanks for clearing all that up. This is all looking pretty good, so far as I've gotten. I think it might be time for @Notsosureofit to put some polish on it, add some prose, and make it a packaged deal. I think it might be time for a spaceflight application minute. Theory is getting pretty heavy once again. and for TE modes, X[subm,n] = the n-th zero of the derivative of the m-th Bessel function. "for TE modes, X'[subm,n] = the n-th zero of the derivative of the m-th Bessel function"
"for TE modes, X[subm,n] = the n-th zero of the derivative of the m-th Bessel function"
to differentiate X' (as used for the TE modes) from X (as used for the TM modes). Perfect timing, in the RF & Microwave Toolbox app I've been using, I found they messed up exactly what you are saying. Emailed developer. See screenshot. Still trying to think of another spaceflight application. 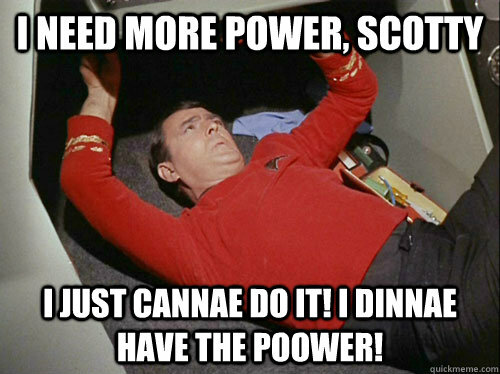 We need more power Scotty! For applications, I would imagine a key figure is practical thrust/weight and thrust/power. It probably isn't enough for a very low orbit PROFAC atmosphere collector, but a high orbit PROFAC might work. Tether/rotovator reboost is another application. If applied, would 'Notsosureofits's' mode calculations significantly help or hinder the 'Mulletron Mission to Saturn'? If applied, would 'Notsosureofit's mode calculations significantly help or hinder the 'Mulletron Mission to Saturn'? Then too, it's not yet apparent why this calculation works at all. Maybe that's what the Cannae was about, short cavity w/ high mode numbers ? I could see where they might have been trying to stabilize some mode w/ the fins, sorta like some magnetrons. I think the other half of the calculation remains to be completed, which is the part concerning how to, and may provide a way to, conserve momentum. The other side of the momentum vector diagram concerns vacuum radiation pressure; well I think it is anyway. At the bottom of page 91 is a nice mashup. We've discussed this in depth in thread one, yet the math remains elusive, but I don't think it is out of our reach. I encountered similar problems with the mode numbers. I note here http://mathworld.wolfram.com/BesselFunctionZeros.html that the first J'0(x) value is given as non-zero in the table but the curve of J0(x) clearly shows a zero for the derivative at x=0. This is explained in the text, but the text does not resolve the question of which value to use for cavity resonance. That of course will change the TE mode numbers. There is also the remark that I found (somewhere) while reading up on Bessel functions or resonance cavitys. In communicating mode numbers it is important to specify the order of the subscripts. Some people communicate TE0,1 as TE1,0 and so forth. Regarding your concern W.R.T. frequency changing with dielectric. The dielectric constant for the Brady cavity dielectric is about 1.76, I think. I obtained this value by iteratively running meep for different values of the dielectric constant and using Harminv to calculate the resonant frequency. The cavity resonated at 1880.5 MHz using a dielectric value of 1.76. I called that close enough. Note that is about 50% density of P.E. I will check using meep again to see how strong an effect the dielectric constant has on the resonance frequency. I have conflicting recall on that subject at the moment. 2) It appears that the exact geometrical dimensions play a paramount role concerning the actual mode shape for a given frequency, particularly for higher modes, where different mode shapes are more likely to give frequencies close to each other. This makes sense. 1) The mode-shape to frequency relation is very sensitive to the exact geometrical dimensions of the cavity. The above-given Fornaro and Aero guesses of the dimensions of the Brady et.al cavity give very different mode shapes (all other parameters being the same). 2a) In all cases examined above, the errors are smaller using the Aero estimate of geometry. 2b) Aero's estimate of geometry (predicting a smaller Brady et.al. cavity than Fornaro) lead to more stable values of mode shape with frequency: Aero's estimate gives the same mode shape (TE310 for both Brady "A" and Brady"B", which differ very little in frequency). Fornaro's geometry gives different mode shapes for Brady "A" and "B". 2c) Aero's estimate of geometry gives more discrimination between mode shapes for Brady cases "A" and "B": the mode shape (TE310) with the smallest error has an error off less than 1% while the next closest mode shapes have errors exceeding 4%. Fornaro's geometry has errors much closer together which do not provide as much power to discriminate between the actual mode shape.
. This dielectric polymer must force the cavity into the TE01 mode shape. As to why I calculate TE011 while NASA Brady et.al give TE012 that also can be readily explained by the polymer dielectric as the dielectric will produce an extra longitudinal full wave in the dielectric polymer, resulting in two full waves in the longitudinal direction of the whole cavity: 1) one full wave within the doughnut-shaped polymer dielectric itself, along the thickness of the doughnut and 2) the other full wave within the longitudinal direction of the rest of the empty cavity that has no dielectric polymer. 4) The Aero geometry estimate of the Brady et.al. cavity (that appear to be the best geometrical estimate) gives TE (transverse electric) mode shapes as the best mode shape estimates for all frequencies tested by NASA Brady et.al. Actually, the TE01 mode is a close mode shape for all the Brady experiments. It just happens that the frequency that best excites TE01 happens to be Brady C, that provided the highest thrust/PowerInput. This is critical, because TE01 is also the mode excited by the dielectric polymer. This is important also if indeed the thrust force is mainly a result of the internal, centrally located magnetic field (contained within the Transverse Electric (TE) circumferential field) being responsible for the experimental results (as previously argued either as thermal buckling artifact or whether as a result of the central longitudinal magnetic field interacting with the Quantum Vacuum providing quantum vacuum radiation pressure, for example). What about a severe conewith a 5 degree opening? Lasers shot up into th mirrorwould glance off at an approximate 7 degerr angle, still proceeding upwards to the conical apex, where they would then be relected directly outwards. Obviously the photons would loose energy with each bounceand you'd have to cool the conical mirror, as at best, you MIGHT get a 97% reflectivity from it, but could THAT work as a propulsive system? (BTW the 7 degree is an approximation of the angle. Your milage may vary). OK, let's use your terminology to check the labeling of the modes. Therefore the modes that have the same numerical value are TM11 and TE01 (and not TM12 or TE02). Conclusion: it appears that the radial quantum number "n" in your mode number is higher than the correct value by one. (For some reason it also appears that your longitudinal "p" is also inflated by one: it should be TM111 instead of TM122 and it should be TE011 instead of TE022). These are the columns that correspond. I couldn't find a formula for a tapered cavity. We are using different radii. I'm thinking of going to the volumetric, might be closest, still looking for an actual f solution. The differences between these different means (just a few % between them) is less than the level of uncertainty we have for the geometry. The difference between these means is much less than the difference between Aero and Fornaro's estimates of the geometry. It would be useful to know what dimensions did you use.